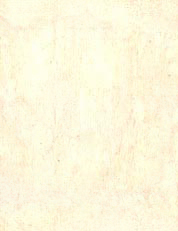 Results 1 - 15 of 18 for "witz"
Description: Reconstruction of stucco reliefs from the entablature of the temple of the cross. 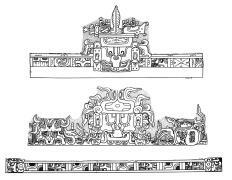 the upper drawing is based on the remains of the north side; the lower drawing is based on the extant remains of the west side. the reliefs represent witz-like deities with gaping mouths. tiny humans sit either atop or near the stone, reptilian front legs of each witz-creature; fish nibble the waterlilies that surround the witz-creatures' heads. See Also: Schele Photos for "witz"
Description: Panel, temple of the foliated cross (image and flanking text panels). at left, k'inich kan b'alam ii stands on a flowering witz ("mountain") while holding a jester god figurine. on the right, a smaller person stands on a shell glyphically identified as the supernatural location "matawil." at center, a world tree, embellished with jewels and maize god heads, grows from a waterlily monster. itzam-ye (the celestial bird) perches atop the tree. Notes: See sd192 and sd 193 for detail drawings of the text. 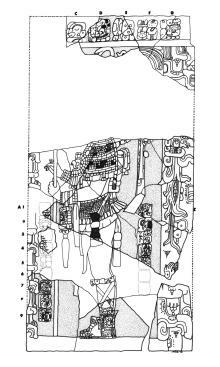 Description: Composite drawing of fragments from north sanctuary jamb, temple of the sun. the image shows k'inich kan b'alam ii standing front of a witz deity that has been decorated with fire and maize vegetation. kan b'alam ii holds a staff or lance in his left hand. the text surrounding kan b'alam ii records mak'ina janaab pakal and lady tz'akbu' ajaw as his parents. 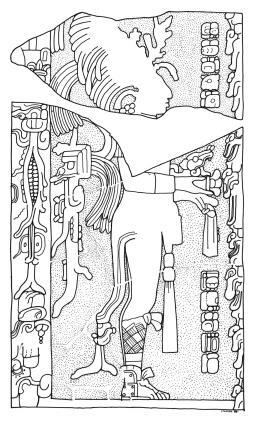 Notes: The text above the panel (labeled c1-g1) reads k'ul-li (likely "his gods") mak'ina kan b'alam bak-way-ya ("bone transformation / supernatural") ah-pitzi-?-wa ("he the ballplayer") k'ul bak ahaw ("holy lord of palenque"). 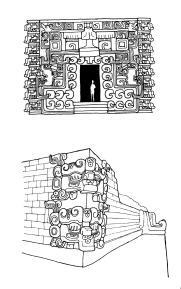 Description: Composite drawing of fragments from south sanctuary jamb, temple of the sun. 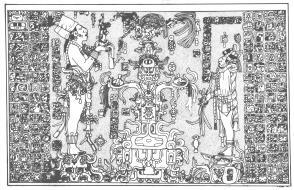 the image depicts k'inich kan b'alam ii standing in front of a witz deity that has been decorated with fire and maize vegetation. in front of him rises a stack of repeating supernatural faces. kan b'alam ii holds a jaguar head or figurine that rests on a miniature bench. he wears an elaborate backrack composed of what appears to be the quadripartite badge. Notes: The text in front of k'inich kan balam ii is badly eroded. Notes: See also sd178 (older version). 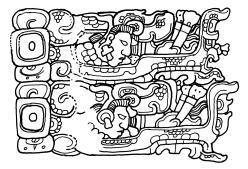 the text in front of k'inich kan balam ii is badly eroded. Description: Detail of witz monster from panel inside temple of the foliated cross. 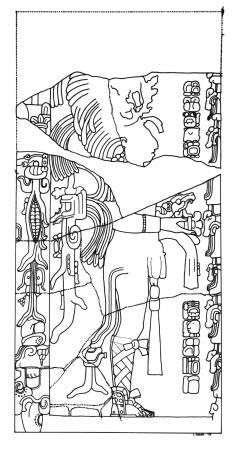 Description: Detail of colossal stucco mask from façade flanking stairs of structure 5d-33-2nd. mask represents open-mouthed witz ("pyramid" or "mountain"). 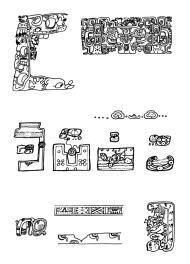 Description: Pencil sketch of fragments from south sanctuary jamb, temple of the sun. the image depicts kan b'alam ii standing in front of a witz deity decorated with fire and maize vegetation. in front of him rises a stack of repeating supernatural faces. kan b'alam ii holds a jaguar head or figurine that rests on a miniature bench. he wears an elaborate backrack composed of what appears to be the quadripartite badge. Description: Comparison of baselines from the cross group panels. from top: temple of the cross, temple of the foliated cross, temple of the sun. Description: Various representations of the witz or "mountain." 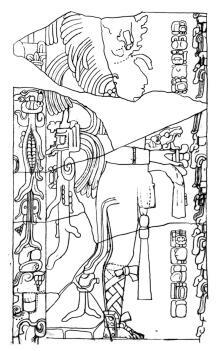 top figure = base from bonampak stela 1 shows maize god emerging from cleft in mountain. 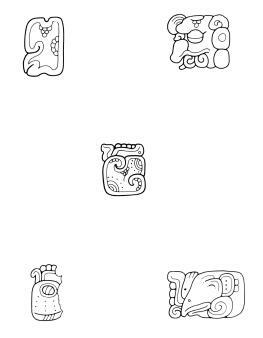 second row, left=personified mountain from metropolitan pot; right=full-figure witz from stela d, copan. bottom row, left=personified eccentric flint from tablet of the slaves, palenque; right=stone ax head from dumbarton oaks panel. 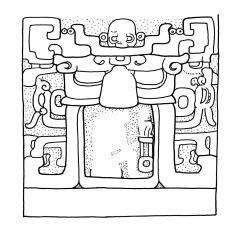 Description: Detail from stela showing stacked witz monsters with maize god seated in eye socket. 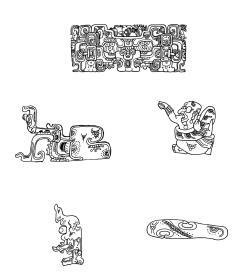 Description: Detail of open-mouthed witz monster at temple 1, tabasquena, campeche and stacked witz monster masks on southwest corner, structure 10l-22, copan. 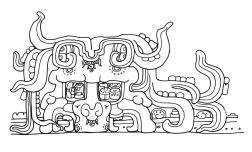 Description: Details of various places and objects, including: cave as the mouth of the witz monster; detail of bonampak witz monster; surface of the water; otot ("house"); pitzil ("ballcourt"); nab ("swamp" or "lake"); cenote; chan ("sky"); cab ("earth"); lakam tun ("stela"); and cave in earth. 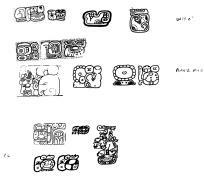 Description: Various isolated glyphs recording witz ("pyramid").